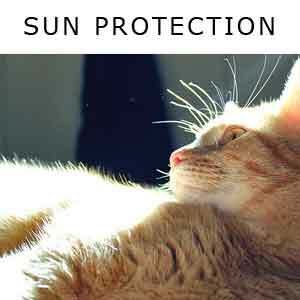 Cat skin problems can be as varied as skin conditions in humans and as such can in some cases be difficult to diagnose. 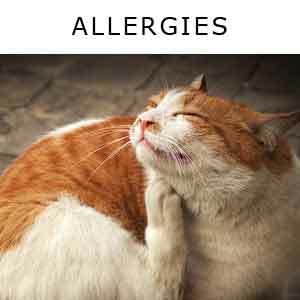 This page is not designed to cover every aspect of skin conditions but to give you ban over view of some of the more common issues, so that you can best help your cat. 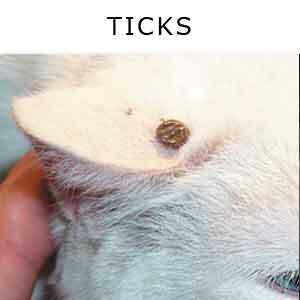 In some cases you will be able to diagnose the problem yourself and be able to treat, such as fleas or other parasites. But in most other cases the only way to correctly diagnose the problem and to start treatment is for a vet to do a thorough examination and carry out various tests. These are of course the number one reason why you may see your cat scratching. 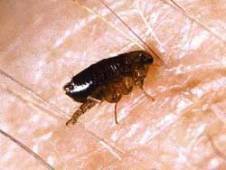 Every cat owner will have at one time or another had to deal with fleas on their cats. 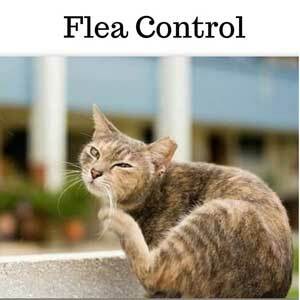 Even with a regular treatment every month, fleas can somehow find their way into the home and give your cats problems. For instance fleas can cause an allergic reaction as they did for my cat Little Mo. 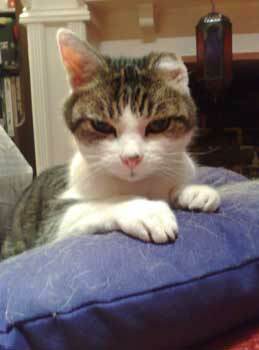 Our usually happy cat Mo suffered briefly from an extreme skin irritation which arose from flea bites. She has never had a bad infestation of fleas but one year she kept scratching and scratching and trying to run away from the irritation which wouldn't leave her alone. We used a flea comb and looked for fleas and other parasites, but all we found was a couple of flea dirts. That was all. 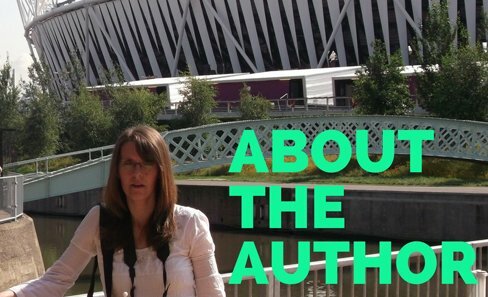 But it was quite apparent that her skin in places looked very red, hot and inflamed. So we took her to the vet who diagnosed flea allergy dermatitis, an allergic reaction to the saliva in a skin bite that can be set off by a single flea! He gave her an antihistamine injection and some prescription flea control for us to use at home. It was like magic! That evening she was a much more relaxed, the terrible irritation had stopped. The harvest mite looks like a small orange specs moving around on the feet, face and ears of the cat. It will cause intense itching. Another common grass dweller which can become a guest on your cat's fur. These are not only uncomfortable for your cat but can cause infection if not removed properly. 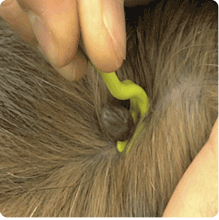 Find out how to remove ticks here. Even our furry friends can become allergic to certain substance like certain foods and chemicals used around the home. Don't forget cats rub themselves against items of furniture and cupboard doors and so they can easily get cleaning chemicals onto their fur which can cause cat skin problems. Using natural products and eco friendly products is better for all of us including our cats. 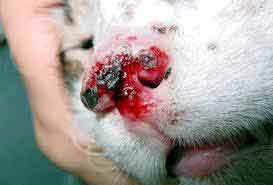 This is a fungal infection which is passed from other animals and humans with ringworm. It can result in patches of hair loss and excessive itching. It is important to treat all animals and humans in the home as well as thoroughly cleaning bedding etc. Dry Eczema - Scaly in appearance. There are many causes of Eczema including, allergic reactions to flea bites and chemicals, cats fed almost entirely on fish can become susceptible, vitamin deficiency and even diabetes has said to be a factor. Skin lumps can be common cat skin problem and they can be caused by many different things. The trouble is identifying what is the cause of the lump and whether or not is a serious health concern. To be on the safe side, any lump that you discover on your cats skin should be examined by your vet. Tumors - A common tumor on cats is called squamous cell carcinomas. These are caused by exposure to the sun and a cat's nose, ears, lips and eyelids are the most common areas for these lumps to appear. If you notice your cat suffering from any of the following symptoms it is time to make sure that fleas or other parasites are not present and to take your cat to the vet for treatment. Inflamed skin which appears red and hot. Lumps or swollen areas.- These can be with or without pain, and can be caused by abscesses, tumors or cysts. Scaly, flaky or crusty skin, sometimes with white skin flakes in the coat. 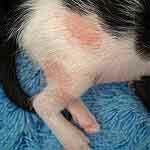 - This can be from fungal infections or fur mites. Bad odor- Often from bacterial or yeast infections. Weeping areas - From inflamed and broken skin or excessive scratching. Bleeding or pus exuding - From an abscess or deep bacterial infection. Spots or a rash.- From insect bites or an allergic reaction. Dull, lifeless or matted coat. - Can indicate an underlying medical or nutritional problem. Black specs in the coat or bedding. - Often flea dirts.